The Sanyo TV factory site in Suffolk is up for sale for between £3.5m and £5m. 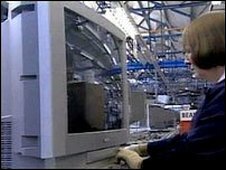 When the Lowestoft factory closed with the loss of 60 jobs in February 2009 the company blamed the economic downturn and "price competitiveness". Aldreds estate agents said the 20-acre site was ideal for future offshore wind turbine production, but it could also be redeveloped for housing. Noel Salmon, the vice-president of Sanyo UK, said the proceeds of the sale would go to the workers' pension fund. At its height, more than 800 people worked at the factory.